As the FOMC raises rates, there are increasing concerns about the credit markets. After a long period of low rates, credit spreads are starting to widen, raising fears of financial stress. In this report, we will look at these concerns. 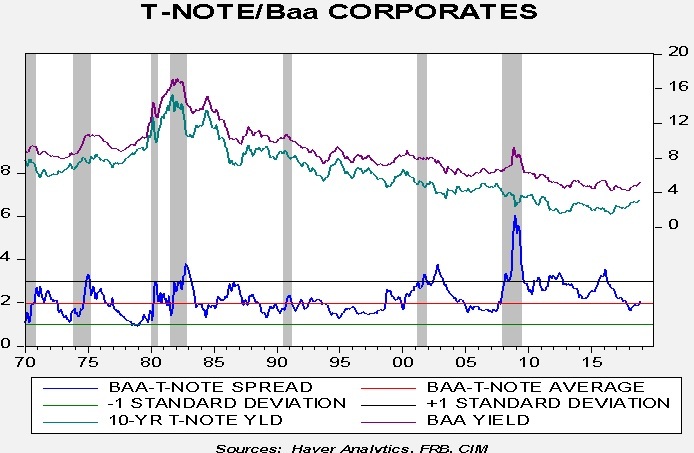 This chart looks at the spread between 10-year T-notes and similar term Baa corporates. The average and standard deviation lines are calculated from 1921. Currently, the spread is about average but it has been widening recently. This chart examines credit spreads with periods of policy tightening. 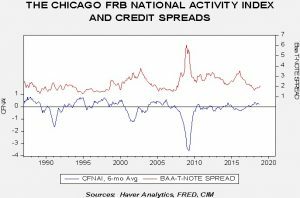 Although policy tightening may bring conditions that trigger a widening of credit spreads, in reality, periods of tightening usually coincide with narrowing credit spreads. This is because the FOMC usually raises rates in response to positive economic conditions, which, coincidentally, are also consistent with conditions that support firms’ ability to service debt. Credit spreads tend to widen when the Fed is easing rates. Third, the key trigger to widening credit spreads is economic conditions. 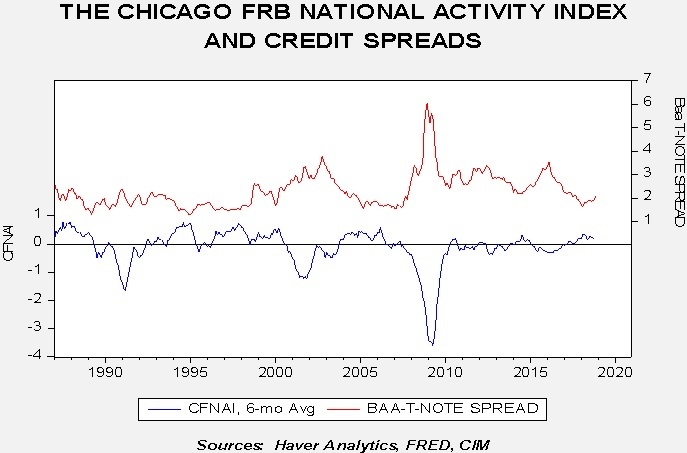 This chart shows the Chicago Federal Reserve Bank’s National Activity Index along with the T-note/Baa credit spread. The national activity index uses 85 variables to track the economy; we smooth the raw data with a six-month moving average. A reading of zero indicates an economy growing at trend. Thus, a reading below zero suggests a weakening economy. Note how credit spreads widen when the index dips below zero. The two series are correlated at -71.9%. 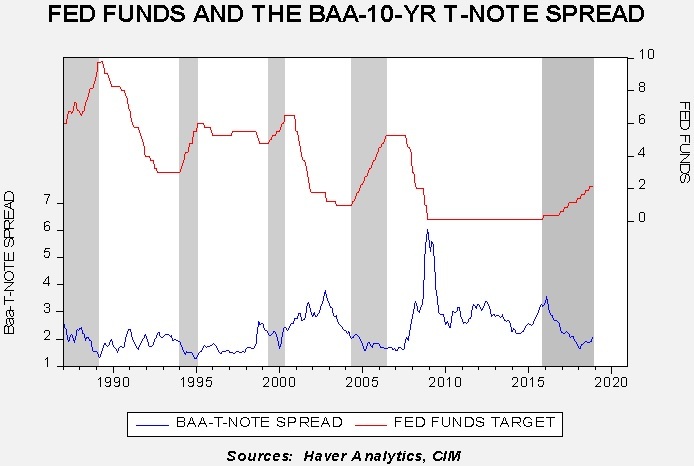 A regression based on this relationship suggests that the recent widening of the T-note/Baa spread is mostly a rise toward fair value. 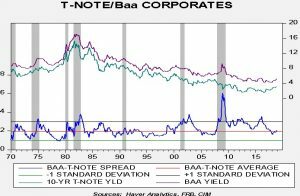 The regression suggests the spread had become too narrow given the performance of the economy. 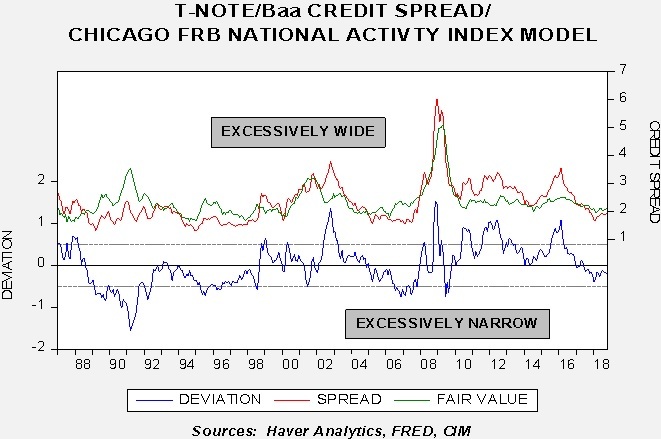 The recent widening has mostly moved the spread back to fair value. 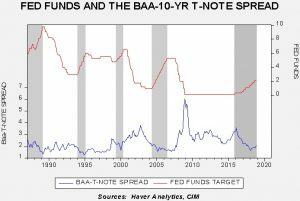 Although it is possible the spread could widen further, it would not be justified based on the performance of the economy. For this reason, we still view credit risk as manageable.